Goebbels responded before a crowd of thousands in Berlin’s sports stadium. According to the account in the Berliner Lokal-Anzeiger of December 7, 1934, the State Orchestra, conducted by Peter Raabe, opened the event with strains of Beethoven. These introduced an actor’s recitation of Hitler’s words from Mein Kampf on the subject of art and the Volk. Then more music, this time Hans Pfitzner’s “From the German Soul.” (Pfitzner would himself soon come under suspicion of “Jewishness,” for his collaboration with the Jewish conductor Bruno Walter, and for his unwillingness to provide a replacement for the “Jewish” Mendelssohn’s score to A Midsummer Night’s Dream.) And after this orchestrated preface Goebbels stepped up to the podium to thundering cries of “Germany Awake!” and rendered his verdict: Hindemith is an “atonal” noisemaker who, motivated by materialism, composed “lurid strains of dissonance ... with complete musical ineptitude.... We are vehemently opposed to seeing this type of artist identified as German. As far as we are concerned, the fact that his heritage is of pure Germanic blood is more dramatic evidence of the festering depths to which the Jewish-intellectual infection has already penetrated the body of our Volk.” Hindemith remained proscribed, and Furtwängler resigned (or was fired) from his post. The Hindemith Affair is not mentioned in Ruth HaCohen’s remarkable book, perhaps because none of the principals involved were actually Jewish. But it does provide a striking confirmation, even an extension, of the book’s important thesis: that Western music, both Christian and Classical, developed in relation—often in negative relation—to ideas about Jews and their music. The idea that Jewish music (or noise) was un-harmonious, insincere, manipulative, materialistic, or in some other way morally and spiritually dangerous: this idea helped to produce (and was also produced by) the Western musical tradition. My formulation of HaCohen’s argument is a simplification, even an impoverishment, of her thinking and erudition. When I refer to ideas about Jews and music, she would add that she is not talking only about ideas, but also about real Jews and real Jewish music. Indeed, one of the many virtues of her book is its demonstration of elements of “dialogue” and “reciprocity” between the music of Jews and non-Jews in Europe from the seventeenth to the twentieth centuries. Moreover, my speaking of “Western music” in the abstract overlooks the extraordinary sympathy with which this musicologist analyzes the individual subjectivity of her protagonists, who include composers such as Mendelssohn and Meyerbeer, writers such as Heine and George Eliot, and even literary and musical characters, such as Eliot’s Daniel Deronda, Wagner’s Parsifal, and Schoenberg’s Moses. This is not to say that the determination is infinitely flexible, or that “Judaism” is some floating signifier empty of meaning. The category of “Judaism” in musical thought has a history, just as it does in economic and social and theological thought; and this history shapes the work to which the charge of Judaism can be put in any given place and time. HaCohen’s book sets out to uncover this history of thought. But the book is not a history in the usual sense. “The search, in this case, is conducted through modes of experience that have survived—however transfigured—in essentially different historical phases.” The goal is to recover these modes of experience (or “Dasein planes,” to use HaCohen’s Heideggerian term), and to string from them a narrative held together not by historical causality, but by a theory—in this case, Freud’s theory of trauma and traumatic memory. GIVEN THE IMPORTANCE of the book’s psychoanalytic orientation, it is both appropriate and moving that it opens with memories of the author’s German-Jewish parents, and of a Jerusalem childhood nourished by German-Jewish fairy tales about princesses who can hear the singing of the stars. Then HaCohen takes up her history, beginning with the late Middle Ages and Renaissance. She characterizes this period as one of largely separate musical identities, with “sonic encounters” producing little musical exchange between Jew and Christian, but in which ideas about the musicality of the other—and especially Christian ideas about Jewish hostility to music—took on important roles in the definition of “collective Self” and “collective Other.” Among the most important of these ideas was the Christian association of Jews with noise rather than music. The phrase “ein Lärm wie in einer Judenschule,” “a racket like that of a synagogue,” plays a central role in this book, and it is in the Middle Ages that HaCohen locates its birth. The charge of noisiness was not only an aesthetic one. In HaCohen’s Middle Ages, Christian harmony and Jewish dis-harmony were posed in an intractable antithesis, one with extensive social and cultural consequences. Their mutual hostility was performed with heightened emphasis during the competing holy days of Easter and Passover, holidays whose rituals were punctuated by frequent outbreaks of Christian violence against Jews. Sometimes this violence was linked to accounts of ritual murder—the charge that Jews murdered Christian children—and sometimes music was presented as a specific motive for slaughter. Geoffrey Chaucer’s Prioress tells a tale of a young boy who learned by heart the Marian antiphon Alma redemptoris mater (“Mother of the Redeeming Spirit”) and sang it every day as he walked through the Jewish quarter, until one day an anti-antiphonal Jew, irritated by the music, slits his throat and throws his body in a privy. Then the Virgin makes the corpse sing so loudly from the pit that the Christians come running. Miraculously resuscitated, the boy tells his story, and all the Jews of the town are killed. It is this story that inspires the book’s powerful title. And yet the “sonic spheres” of medieval Christians and Jews may not have been quite as separate as HaCohen suggests. 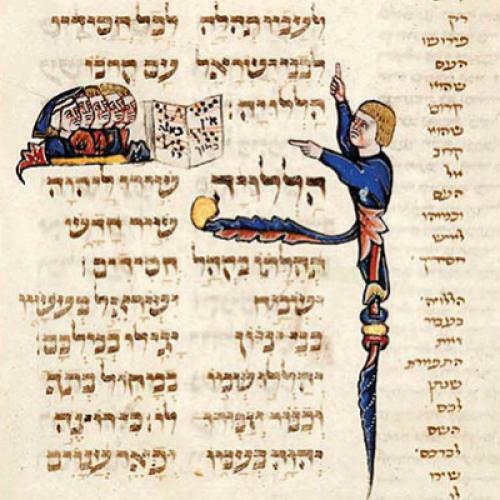 It is certainly noteworthy that despite long centuries of co-habitation, medieval Jews never borrowed the musical notation of the surrounding Christian culture from which they borrowed language, art, architecture, ritual practices, dress, cuisine, and so much else. But some of the Jewish impermeability perceived by HaCohen is the result of her choice of sources, which are largely religious and liturgical, and from German speaking lands (known to Jews as Ashkenaz). In other genres and in other places we find much more exchange. Jews sang Christian troubadour songs in thirteenth-century Mediterranean towns. Jewish moralists such as Jacob Anatoli inveighed against “the songs of the uncircumcised,” which he claimed—sounding like a 1950s anti-Elvis preacher—led Jewish girls “into the path of harlotry.” In fourteenth- and fifteenth-century Catalan courts, there were Jews teaching music and dance. And in the sixteenth century we find conversos providing musical pleasure to princes in Italian and English cities. (Conversos were converts from Judaism or their descendants, who were often treated by Christians as if they remained essentially Jewish.) Even in Ashkenaz, a troubadour such as Susskind of Trimberg can suddenly appear, wearing his Jew’s hat in a medieval manuscript of German love songs. In fact, in some places the soundscape of the medieval world was not so different from the one that HaCohen ascribes to contemporary Israel-Palestine, in the lyrical page with which her book concludes. As in today’s Jerusalem, church bells might mingle with shofars and Adhan calls in fourteenth-century Valencia. There, too, “sonic encounters” were sometimes conflictual, sometimes utopian, and often a blend of the two. Medieval Muslim communities routinely paid their Christian overlords for the privilege of projecting the muezzin’s call to prayer over a landscape conquered in Jesus’s name. When, in 1228, the Franciscan Friars of Mallorca charged that the chanting of the Jews in their synagogue offended Christ’s ears, harmony was restored by a payoff to the Friars: a sonic version of what we would call a shake-down or a licensing fee. Even Christians—such as the blacksmith in Barcelona whose hammer-strokes “disturbed the divine office”—could find themselves forced to pay off neighboring priests. And we should not forget that in medieval Iberia the three religions forged a music that—as any fan of Jordí Saval knows—provides basic repertoire for the modern “musical dialogue” that HaCohen celebrates in the last paragraphs of her book. It is important to remember that these examples of enmity were not the product of “real” sonic encounters: there were no Jews in Chaucer’s or Shakespeare’s England. But the questions they raise were real enough, if not for Jessica, then for the many Jews and converts from Judaism who would later struggle to articulate their relationship to Christian musical culture in modern Europe. HaCohen devotes two chapters to this struggle, and they are riveting. In them we see Mendelssohn, Meyerbeer, Halévy, Schoenberg, and other Jewish or convert composers exploring the musical possibilities of Judaism, assimilation, and conversion. HACOHEN’S BOOK is studded with such theses at the level of group, generation, and genre. (Its observations about oratorio as a genre would alone suffice to reward its close reading). Yet its most extraordinary contribution is not any particular thesis or generalization, but the multi-layered readings of literary and musical works through which HaCohen builds her individual case studies. In each we are introduced to the historical milieu of each composer and author. We learn, for example, about Mendelssohn’s engagement with Goethe; about his conversion to Protestantism, and about the cultural and religious context of his project to recover Bach’s St. Matthew’s Passion for the nineteenth century. We hear about his defeat (perhaps facilitated by anti-Semitism) in the elections of the “Singakademie,” and after that defeat, of the academy’s performance of Bach’s St. John’s Passion under a different conductor’s baton. But we are also led through a “theological-phenomenological” assessment of the two Passions, in order to see how they differed historically (the Gospel of John’s Jews are different than those of the Gospel of Matthew) and musically (the structure of Bach’s John is more monolithic and repetitive, his Matthew more dialogic and resonating) in the potential engagements with Judaism they could catalyze. And finally, we are forced to reflect on how the texts that Mendelssohn chose for his own oratorios (Elijah, St. Paul) and the music he wrote for them (compare the “Es ist genug” aria of his Elijah with the “Es ist vollbracht” of Bach’s John) reflect specific struggles with the difficulties that the “Christian-ness” of music generated for German Jews and converts from Judaism in the first half of the nineteenth century. Each case study takes us as through a magnifying glass into an unknown gem, many and mysterious facets gleaming in a forest of reflection and delight. Consider HaCohen’s chapter called “The Aesthetic Theology of Multivocality: Arnold Schoenberg among Alter Egos.” The title already points to multiple mysteries. Aesthetic theology, we imagine, is meant to suggest a field every bit as fertile as its more famous cousin, political theology. Multi-vocality places us in a soundscape—simultaneously choral and psychoanalytic—in which many selves and voices resist reduction to unity or harmony. And alter egos, we suspect, will emerge not only from the composer’s cultural context, but also from the music itself, as figures and motifs into which, as HaCohen shows us again and again, composers and authors project the vital questions of their being. Through the bull’s bellowing HaCohen links this scene, which Elias Canetti called “the loudest passage in Kafka’s work,” to the thinking of another Austrian Jew, the psychoanalyst and disciple of Freud Theodore Reik. Reik’s essay “The Shofar,” written in 1919, is something of a commentary on Psalm 89:16: “Hail to the people who understand the sound of the horn, they shall walk in the light of your countenance.” His analysis, she explains, “capsizes the conventional Christian categorization of Jewish noise.” In the shofar’s blast, Reik saw the surfacing of repressed guilt at a primordial parricide: in this case, the young “Israelite” Ram god’s killing of the elder Egyptian Bull god. The shofar blast embodies, in Reik’s words, “the guilty conscience of the son who killed and devoured the father-god [and] instituted the law for the preservation of the totem.... Music is here the representative of morality.” According to this defensive interpretation, Jewish noise is indeed music—and music in the best ethical sense. Readers will immediately recognize in Reik’s analysis of the shofar a link to Freud’s Totem and Taboo, and a foreshadowing of his Moses and Monotheism, written after the Nazis’ rise to power, in which the elderly founder of psychoanalysis understood the Christian deicide accusation against the Jews as a repetition of a traumatic memory of the Israelites’ killing of their Egyptian leader Moses in the desert. But the linkages do not stop here. HaCohen turns now to the glissando sonorities of Schoenberg’s cellos in the Golden Calf scene of his oratorio Moses and Aron, in which she hears the bellowing voices of the Bull god on the verge of slaughter. And out of the musical and narrative tensions of the scene she begins to construct Schoenberg’s struggle with the basic oppositions of the theological aesthetics of his age. These oppositions, already encoded in lapidary Christian antinomies such as Paul’s “the letter kills, but the spirit gives life,” had long since been mapped onto the difference between “Christian” and “Jew,” and thence via countless cartographies onto musical “oppositions” such as dissonance v. harmony, surface v. depth, formalistic v. inspired, words v. music, epigone v. genius. In what comes closest to a statement of her methodological commitments, HaCohen writes that “such resurfacing syndromes were theoretically and clinically recognized by Freud and his school.” Trauma, repressed and recovered memory, the compulsion to repeat: these “resurfacing syndromes” from Freudian psychoanalysis serve her as analogies for history. Hence her willingness to recognize these syndromes not only in individuals (and in the literature and music that they produce) but also in the “lives” of collectives across long swaths of historical time. There are reasonable objections to such methods. It is by no means clear that models derived from the individual can be adapted to the analysis of groups or societies. Psyche and memory may be very misleading analogies for culture and history. Moreover, Freud’s syndromes were themselves the products of a particular place and time. Perhaps we should not seek in them a universal explanation for continuity and change across history. And yet such objections. though valid, miss the beauty of HaCohen’s book, and the relief that it brings. For whether or not the analysis is historically true in every detail, it teaches us—like any good analysis?—something vital about our present and our past, and in doing so it allows us to love and to live our music in new ways. THE LESSON IS STILL necessary today. “Jewishness” remains a critical term in the aesthetics and the politics of music (and many other topics), although it is used in different ways and different contexts than those that HaCohen so brightly illuminates. Perhaps the most important of those contexts, and certainly the most obvious, is that of the Arab-Israeli conflict, which has animated a book such as Farag El-Antari’s The Zionist Plunder of Arabic Music. Published in Arabic under the auspices of the General Union of Arab Artists in 1997 and re-issued in 2001, the book stresses the corrupting effects of sonic encounters between Jews and Arabs. El-Antari describes the musicological efforts of the “Arab Music Conference,” held in Cairo in 1932, as a Zionist plot, facilitated by Egypt’s Prime Minister Ismail Sidqi (whom, we are told, was corrupted by both sexual and economic relations with Egyptian Jews), to despoil Arabs of their music. The Jews, he claims, wanted to undermine the pan-Arab unity manifest in “songs of camel smithy ... palm-tree pollenisation,” and other Bedouin music, which they wished to appropriate in order to give a false genealogy to the Psalms, much as they tried to deny the true Pharaonic origins of the harp in order to attribute its invention to King David. Just as sinister as these early twentieth-century projects, according to El-Antari’s study, are more recent Zionist attempts to “infiltrate” Arabic music, such as the performance in 1993, at the Cairo Opera House, of Saint-Saëns’s opera Samson and Delilah. Saint-Saëns was not Jewish. (Remember, neither was Hindemith.) But he is complicit in the “Zionist plunder” because (according to El-Antari) his libretto was based on sections of the biblical book of Judges that proclaim Israel’s right to the lands of Palestine. This and other “Jewish” performances (such as the performance in June 1997, thirty years after the Six Day War, of Ernest Bloch’s tone-poem “Schelomo, Hebrew Rhapsody for cello and large orchestra”) represent the second Zionist attack on Arabic music, one that seeks to corrupt Egyptians from within. In this rhetoric of infection, corruption, and theft, I hear symptoms of syndromes closely related to those HaCohen has discovered at the heart of European music, though perhaps even more fantastic, in that there are no “real” Jews or Zionists in Arabic music today, no Meyerbeers, Halévys, and Schoenbergs to serve as points of projection for the criticism of a Wagner or a Goebbels. The “music libel” is alive and well. That is one more reason, though a lugubrious one, to be grateful to HaCohen and for her extraordinary book. Felix Mendelssohn once complained that “so much is spoken about music and so little is said. For my part I do not believe that words suffice for such a task, and if they did I would no longer make any music.” Lest our composers cease composing, let us grant that words remain in some sense insufficient to the task of music. Yet Ruth HaCohen’s words teach us a great deal: about Judaism and Christianity, about the harmony and the disharmony between them, and yes, pace Mendelssohn, about music.